The John F. Kennedy Space Center (KSC) is the United States launch site that has been used for every NASA human space flight since December 1968. 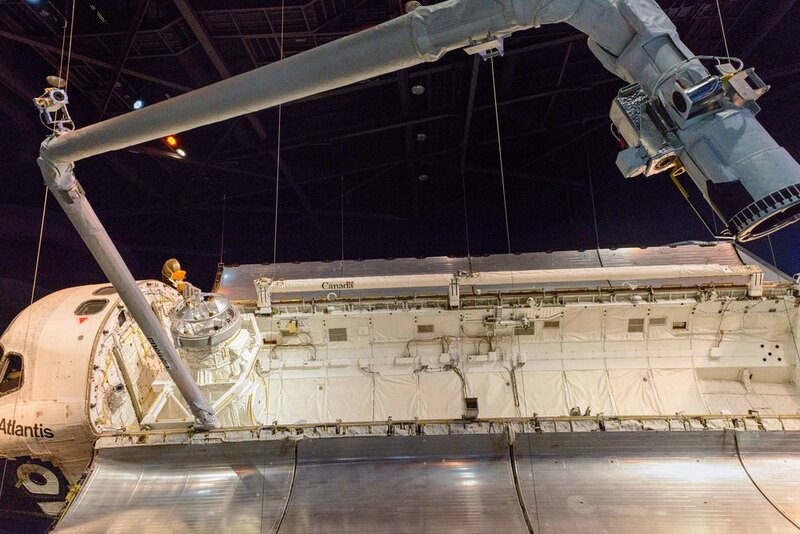 Although such flights are currently on hiatus, KSC continues to manage and operate unmanned rocket launch facilities for the U.S. government's civilian space program from three pads at the adjoining Cape Canaveral Air Force Station. Its Vehicle Assembly Building (VAB) is the fourth-largest structure in the world by volume, and was the largest when completed in 1965. Located on Merritt Island, Florida, the center is north-northwest of Cape Canaveral on the Atlantic Ocean, midway between Miami and Jacksonville on Florida's Space Coast. It is 34 miles (55 km) long and roughly 6 miles (10 km) wide, covering 219 square miles (570 km2). Rocket Garden, Kennedy Space Center Visitor Complex, Florida. 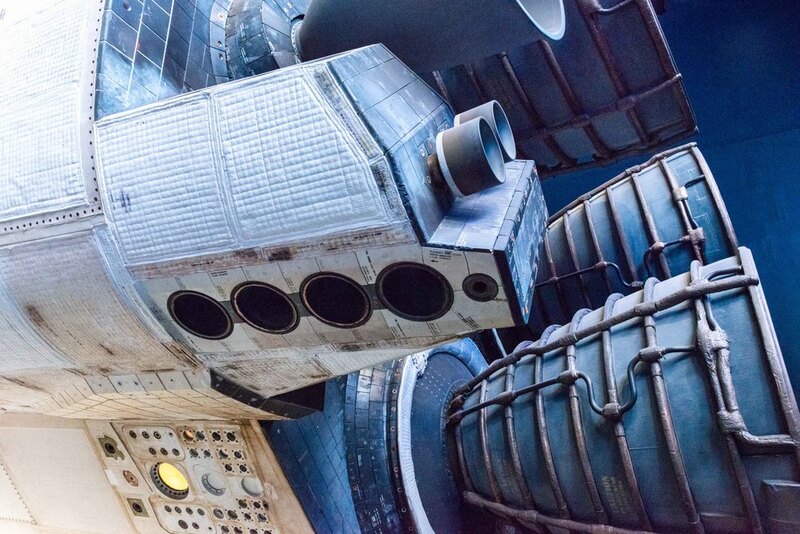 F1-Engine, the most powerful liquid-fueled rocket engine ever produced. F1-Engine - The Power of Apollo Rocket Garden, Kennedy Space Center Visitor Complex, Florida. The service arm to the Saturn V Rocket with the command module. Sign in the White Room, the last stop for astronauts before the went into the command module. The Command Module of the Apollo missions. 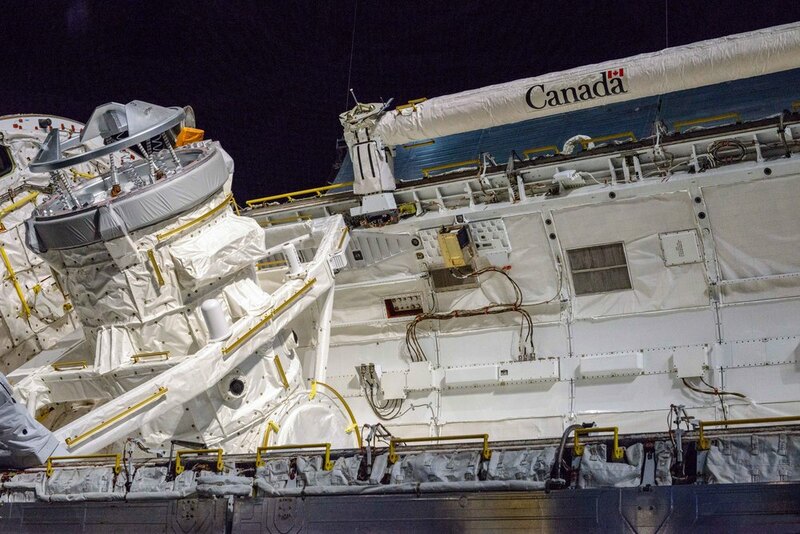 The service arm, White Room and Command Module from the outside. 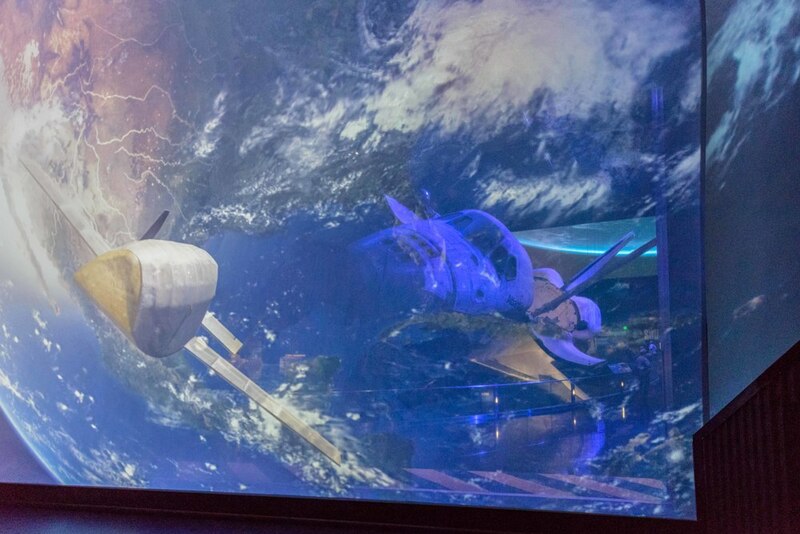 Entrance to the Exhibition: "Space Shuttle Atlantis" and "Shuttle Lunch Experience (SLE)", Kennedy Space Center, Florida. Theater inside of the building for Space Shuttle Atlantis. Entrance from the Theater to the exhibition. 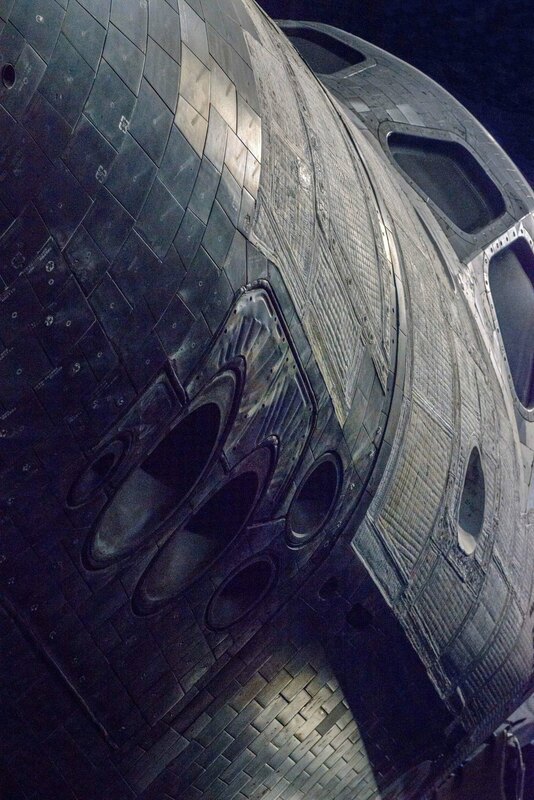 Space Shuttle Atlantis, Kennedy Space Center, Florida. 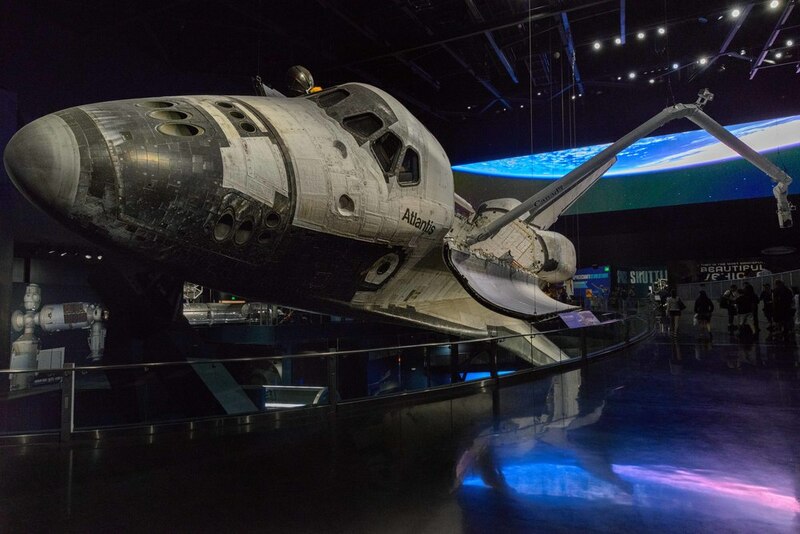 Exhibition "Space Shuttle Atlantis", Kennedy Space Center, Florida. Kennedy Space Center, Vehicle Assembly Building (VAB), Located on Merritt Island, Florida. Vistor overview at the Launch Complex 39 (LC-39) is a rocket launch site at the John F. Kennedy Space Center on Merritt Island in Florida, USA. Launch Complex 39 (LC-39) is a rocket launch site at the John F. Kennedy Space Center on Merritt Island in Florida, USA. An elevated water tank near each pad provided sound buffering protection for the launching spacecraft. Part of the Sound Suppression Water System (SSWS), the 290-foot (88 m) water towers stored 300,000 gallons (1.1 Megalitres) of water, which was released just before engine ignition. The water discharged onto the launch platform during lift-off muffled the intense sound waves produced by the first stage F1 engines. Due to heating of the water, a large quantity of steam was produced during launch. A flame deflector was slid on rails into place under the launch pedistal. This system allowed for rotation with a second flame deflector, after the first was refurbished after each launch. Each pad had a 200-foot (61 m) evacuation tube running from the Mobile Launcher platform to a blast-resistant bunker 39 feet (12 m) underground, equipped with survival supplies for 20 persons for 24 hours. There was also a cab/slidewire system running from the 322-foot (98 m) tower level to evacuate astronauts and technicians 2,503 feet (763 m) away from the pad. 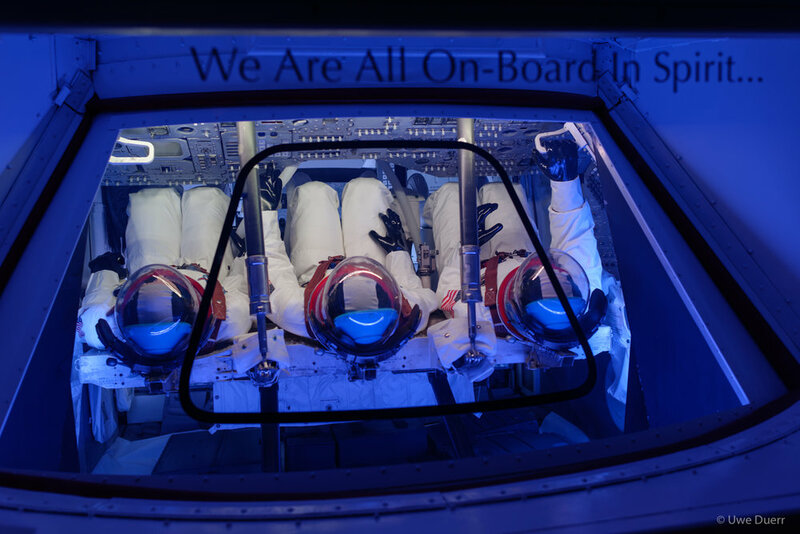 The Firing Room Theater re-creates an Apollo launch and the Lunar Theater depicts the first moon landing. The Apollo / Saturn V Center features a 363-foot moon rocket. F1 engines of the Saturn V rocket. 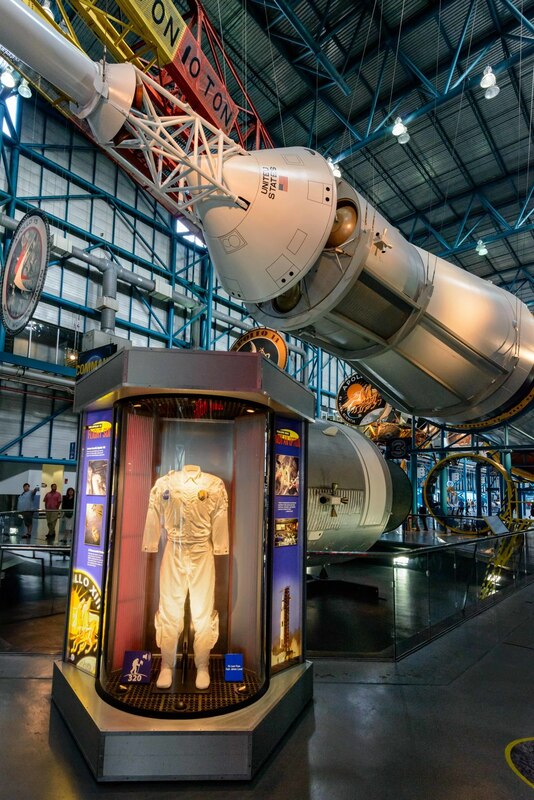 The Apollo / Saturn V Center Exhibition. The Apollo 14 Service and Command Modules. Inside the Apollo 14 Service Module. The Apollo 14 Command Module, the "Kitty Hawk". Above the Service Module. Flight suit worn by Apollo 13 Commander James Lovell. Apollo 14 capsule named "Kitty Hawk". The capsule "Kitty Hawk" was crafted with more than 2,000,000 parts. 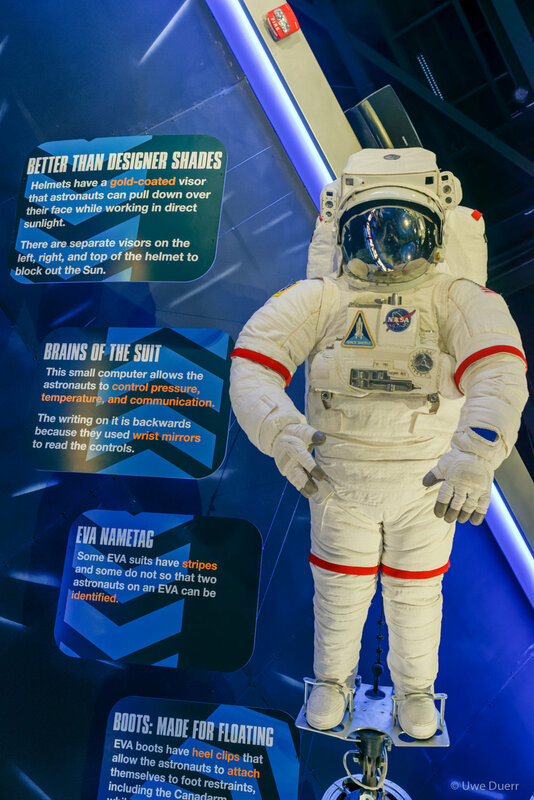 Prototype spacesuits during the Apollo program. Alan Shepard's custom-made original A7-L spacesuit from the Apollo program. 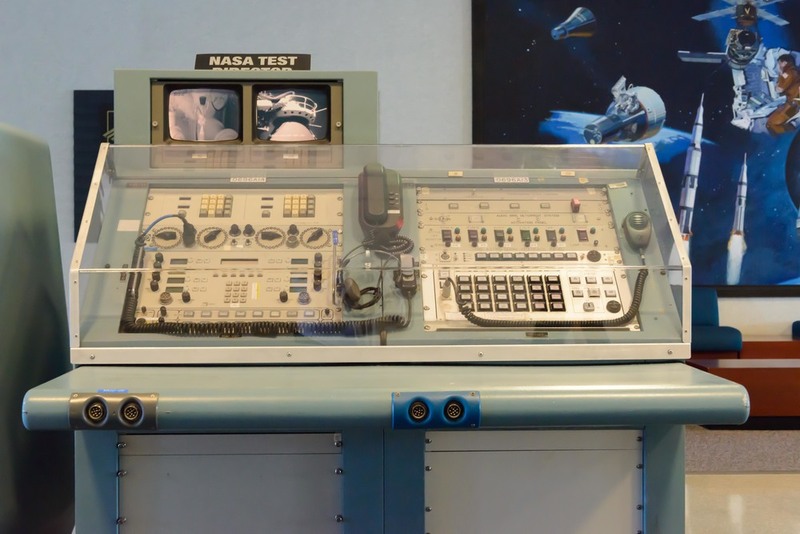 Exhibition at Lunch Control Center, Kennedy Space Center, Florida. View to Lunch Pad 39A from the Lunch Control Center. The last greetings in the Main Entrance Hall at Lunch Control Center.